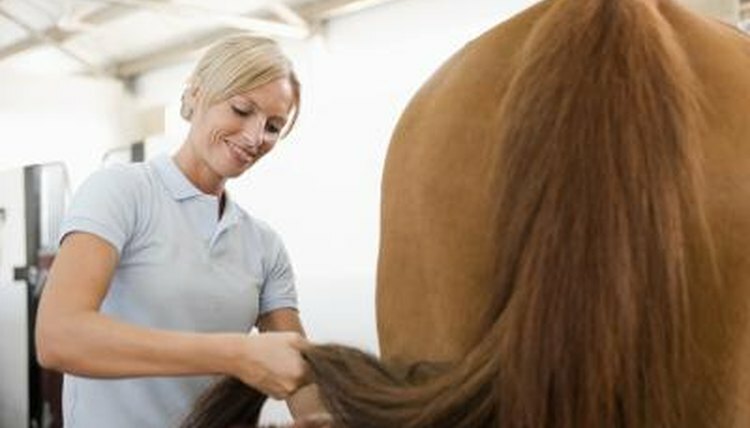 If you've marveled at the length and thickness of the horses' tails at horse shows or demonstrations, you probably wish to replicate that beauty in your own horse. A long, thick tail suggests good health. Daily grooming and strategic use of control products will increase the health of your horse's tail almost immediately. You cannot rush the growth process, but you can care for the existing strands to make them grow longer. A malnourished or undernourished horse cannot grow a long, healthy tail. Make sure your horse is eating a balanced diet with all the vitamins and minerals he needs. Pasture grazing is one means of improving his diet, as grass contains omega-3 fatty acids, which strengthen the hairs and promote growth. You can also add supplements to your horse's grain, such as linseed oil and flax. These supplements will improve the condition of the mane and coat as well as of the tail. Use a dandy brush to remove sawdust and other particles from the dock of the tail at least once or twice a day. The bristles stimulate circulation, which promotes tail growth. Avoid regular brushes for the rest of the tail, as they pull out hairs. Instead, start at the bottom of the tail, using a wide-tooth comb, and work up the tail as gently as possible. Comb the tail only once every few days. Between combings, use your fingers to gently separate the hairs. Conditioners can strengthen strands and reduce tangles. Use your hands to work conditioner through the tail, starting at the bottom and working your way up. Wash-out conditioners must be thoroughly rinsed from the strands after bathing, while leave-in conditioners can remain. Conditioners work especially well for the dock of the tail, preventing itching. Bagging your horse's tail protects it from the elements while he is turned out in the paddock or pasture. A bag prevents your horse from stepping on his tail if it reaches the ground, but it also allows the horse to continue using his tail for fly swatting. Braid the tail first to shorten its length, then slip the bag over the braid and tie it just below the tail bone. Remove the bag at least once a week to let the tail breathe and to comb the hairs. If your horse's tail doesn't appear to be growing, using a bag will stop you from brushing it too often and pulling out valuable strands. Instantly improve a tail's appearance by banging the ends. Use a pair of sharp scissors to blunt the bottom of the tail so all the strands are approximately the same length. This makes the tail appear fuller and healthier, and eliminates the tapered look that frustrates many horse owners. The tail will be easier to braid when the hairs are all the same length. Why Do Foals Chew Their Mothers' Tails?